You might be wondering why in the world I chose a name like “My Secret Sin” for this red velvet cake. Well, I will tell you because I am I cool like that. I chose that name because I think this is unlike any red velvet cake I have ever had. Usually you have cream cheese frosting…and this does too… but it hides a luscious, lavish secret. Perfect for a Valentine’s Day dessert. I think that by multiplying the recipe it would be an amazing wedding cake as well. 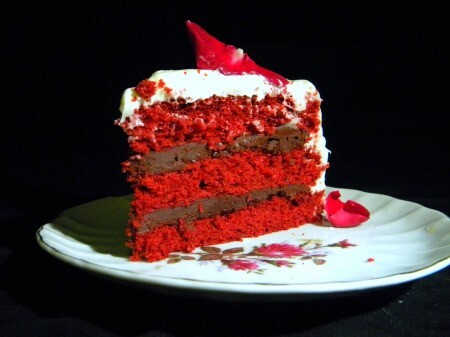 Rose scented red velvet cake. Yep… one of my favorite flavor combinations is chocolate and rose and it complements this cake perfectly and makes it the ultimate Valentine’s Day dessert. This is absolutely the best red velvet cake I have come up with so far… but I am not done trying. The cream cheese frosting is the creamiest that I have made yet. It is a little hard to work with because it is so loose but I think if you take the time to do a crumb layer and freeze it for a little while you will get better results. I used bittersweet chocolaet in the ganache, as well as extra butter…and added a little rose to give the cake slightly more rose flavor. I cooled the ganach until it was creamy and spreadable and then filled between the layers with a thick layer. I piped the frosting around the outside to keep the ganache from oozing out the sides as I was frosting the cake. Once I had the layers stacked I ran a drinking straw through the center to hold everything in place while I finished the cake. If you are going to be transporting it just cut the straw even with the top and frost over it. Take it out when you cut into the cake. It will keep it stable. This image is close to the vibrant color of the cake. I used a full bottle of red food color. I don’t like the food colors because they are not natural but there is nothing else that will give this cake this kind of color. I tried beets and you can see the color difference in my Red Velvet and Cheesecake Swirl Cupcakes post. There are now organic, natural dyes but I have not tried them in this cake. Red color? Rose scent? Chocolate ganache? Don’t you agree that this is the ULTIMATE Valentine’s Day dessert? Yep… I thought you would. Divide batter between the three pans. This can be made a couple of days ahead and refrigerated, tightly covered. Just remove from the refrigerator for about 20 minutes before using. Stir in rosewater and cool. Refrigerate until thick and spreadable. Spread half between the first and second cake layer and half between the second and third cake layer. This can also be made ahead. Beat the butter and cream cheese until well blended and fluffy. Add the confectioner’s sugar and continue to beat until smooth. You may need to add a bit more or less than specified. Frost the tops and sides of the Red Velvet Cake. Refrigerate if keeping longer than a few hours or if it is a warm day. Good luck.. let us know how it goes! I forgot to ask about the pans, I don’t have cake pans, only springform ones, can I use them and will the cook time be the same for one pan or longer? thank you. The batter will likely leak through springform pans – you should really try to get some regular cake pans. I’m not a baker but I’ll try making this one. I have month long craving for a red velvet in pink. What is the vinegar for, can I substitute with lemon? Also I’m using this recipe because of the buttermilk and rose water but I’m not making the ganache, will it still have good flavor? Can I add some white chocolate? Would you be able to use gel coloring and then not have to use a whole bottle? After living in the south for many years, I love red velvet cake! Martha, I am not sure what the difference was unless it was in the heavy cream/ chocolate. I use organic heavy cream. Some cream is skim milk with stabilizers and that won’t work well. I also filled the cake when the ganache was easily spreadable. Holy freakin’ cow. I love red velvet cake, and just imagining it with ganache in the layers? That is brilliant. That sounds heavenly. Chocolate makes a great thing even better, of course! Yes yes yes yes yes!!!! You officially need to bake my wedding cake for a wedding I’m not likely to have anytime soon! !